A quarterback attempts a forward pass. American football, known in the United States simply as football, is a competitive team sport known for its physical roughness despite being a highly strategic game. The object of the game is to score points by advancing the ball into the opposing team's end zone, kicking a field goal, or scoring a safety by tackling an opposing team's ball-carrier in his own end zone. The ball can be advanced either by carrying it or by throwing it to a teammate. The winner is the team with the most points when the time expires and the last play ends. American football descended from rugby football, played in the United Kingdom in the mid-nineteenth century. The first game of college football was played on November 6, 1869 between Rutgers University and Princeton University. The first modernized game was on June 4, 1875 between Harvard University and Tufts University. Professional football developed in the mill towns of Pennsylvania and the American Midwest in the early twentieth century. The National Football League (NFL) was founded in 1920 in Canton, Ohio, and is now comprised of 32 teams. Today, football is the most popular American sport, with the day of the NFL championship—the Super Bowl—being one of the biggest occasions for social gatherings in the United States. Outside the United States, the sport is referred to as American football to differentiate it from other football games. In Australia and New Zealand, the game is known as Gridiron, although in America the word "gridiron" refers only to the playing field. Variations of the game include Canadian football and Arena football. An early U.S. football team. American football dates from the early 1800s when teams in various colleges and secondary schools met. They usually played by kicking or batting at the ball, as in varieties of football played in the United Kingdom. In 1867, the convergence of various developments at Eastern colleges and schools led to the codification of American football. Rutgers University and Princeton University played the first recorded game of American college football on November 6, 1869 in New Brunswick, New Jersey, won by Rutgers 6-4. Today, Rutgers is popularly recognized as the "Birthplace of College Football." However, English Football Association rules were followed in this Princeton/Rutgers contest; participants were only allowed to kick the ball, not handle it; and each side had 25 men. Thus, some see the Princeton-Rutgers meeting of 1869 as the first intercollegiate game of "soccer" in America, but not American football (Smith 1988). In 1870, Rutgers invited Columbia for a game, and the popularity of intercollegiate competition in football would spread throughout the country. 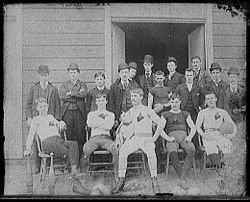 Dartmouth College students played a football-like game now known as "Old Division Football," for which they published rules in 1871. In 1873, Columbia, Rutgers, Princeton, and Yale met to formulate the intercollegiate football rules for the games they played. This meeting is notable for two reasons. First, it is the first attempt at making a single set of rules for all schools to follow. Second, Harvard refused to join the meeting. Harvard University and Tufts University played one of the "first" games that would be recognizable to modern fans as American football on June 4, 1875 at Jarvis Field in Cambridge, Mass., won by Tufts 1-0. A report of the outcome of this game appeared in the Boston Daily Globe on June 5, 1875. 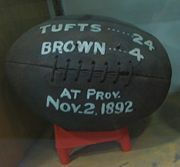 In the Tufts-Harvard game participants were allowed to pick up the ball and run with it, each side fielded 11 men, the ball carrier was stopped by knocking him down or "tackling" him, and the inflated ball was egg-shaped. A year prior to the Tufts-Harvard game, Harvard faced McGill University of Montreal, Canada on May 14, 1874 in a game under rules similar to the Tufts-Harvard game. To this day, Harvard, McGill, and Tufts continue to field football teams though they no longer play each other. Encouraged by Yale University's Walter Camp, the schools began to adopt the rules that would differentiate American football from rugby in the 1880s. The scrimmage was introduced in 1880 and the system of downs in 1882. However, by the turn of the twentieth century, football had become notoriously dangerous, and 18 college players died in 1905 alone. Colleges responded with a series of rule changes to open up the game, most importantly the forward pass, along with outlawing dangerous formations such as the "flying wedge," and introducing and requiring better equipment such as helmets. The game achieved its modern form by 1912, when the field was changed to its current size, the value of a touchdown increased to six points, and a fourth down added to each possession. Originally dominated by the Ivy League, football soon captured the interest of colleges nationwide. By 1916, when the Rose Bowl game matching eastern and western teams became an annual event, football had developed a national following, second only to baseball among team sports. Professional football developed in the mill towns of Pennsylvania and the American Midwest in the early years of the twentieth century. The future National Football League (NFL) was founded in 1920 in Canton, Ohio as the American Professional Football Association; it adopted its current name in 1922. Professional football remained a largely regional sport of secondary importance to college football until after World War II, when television broadcasts boosted NFL football's national appeal. The professional game had surpassed both college football and baseball in popularity by the early 1970s. The first Super Bowl—between the champions of the NFL and the rival American Football League—was played in 1967, and the leagues merged in 1970. Befitting its status as a popular sport, football is played in leagues of different size, age, and quality, in all regions of the country. Organized football is played almost exclusively by men and boys, although a few amateur and semi-professional women's leagues have begun in recent years. The 32-team National Football League (NFL) is currently the only major professional American football league. There are no developmental or minor leagues, but the similar sports Arena football and Canadian football are considered lower-level leagues. 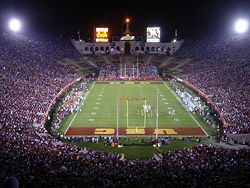 University of Southern California football games at Los Angeles Memorial Coliseum attract more than 90,000 fans. College football is also popular throughout North America. Nearly every college and university has a football team, no matter its size, and plays in its own stadium. The largest, most popular collegiate teams routinely fill stadiums larger than 60,000. Several college stadiums seat more than 100,000 fans and usually fill them to capacity. The weekly autumn ritual of college football includes marching bands, cheerleaders, homecoming parties, and the tailgate party, and forms an important part of the culture in much of small town America. Football is generally the major source of revenue to the athletic programs of schools, public and private, in the United States. Most American high schools also have football teams. In the Southern United States, many schools regularly fill stadiums holding over 10,000 fans and can afford artificial playing surfaces. Since high schools in the United States are tied to the town they are situated in, the football team is often a chief source of civic pride in small towns, and football heroes are very well-regarded in their communities. Football is also played recreationally by amateur and youth teams (e.g., the Pop Warner little-league programs). There are also many "semi-pro" teams in leagues where the players are paid to play but at a small enough salary that they generally must also hold a full-time job. Due to the violence and expense of the sport, many football games involve variations of the rules to minimize contact. These include touch football and flag football, both of which do not involve tackling and usually omit helmets and padding. Football is an autumn sport. A season typically begins in mid-to-late August and runs through December, into January. The professional playoffs run through January. Canadian football features a wider field, fewer downs, and a 12-man team. It is a long-standing tradition in the United States, though not universally observed, that high school football games are played on Friday night, college games on Saturday, and professional games on Sunday. In the 1970s, the NFL began to schedule one game on Monday night on ABC. In recent years, nationally televised Thursday night college games have become a weekly fixture on ESPN. Certain fall and winter holidays—most notably Thanksgiving and New Year's Day—have traditional football games associated with them. The professional Canadian Football League and collegiate Canadian Interuniversity Sport play under Canadian rules, which involve fewer downs, a wider field, more players, and thus emphasize the passing game more than the NFL. 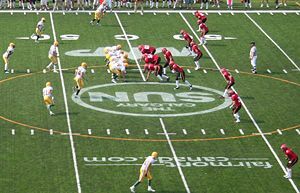 The NFL operated a developmental league, NFL Europa, with teams in five German cities and one in the Netherlands, but this league folded following the 2007 season. The sport is popular as an amateur activity in Mexico and American Samoa and to a lesser extent in Japan, Europe, Korea, The Bahamas, Chile, Brazil, Uruguay, Argentina, Australia (Gridiron Australia), Israel, and the United Kingdom (BAFL). The International Federation of American Football is the governing body for American football with 45 member associations from North and South America, Europe, Asia, and Oceania. The IFAF also oversees the American Football World Cup, which is held every four years. Japan won the first two World Cups, held in 1999 and 2003. Team USA, which had not participated in the previous World Cups, won the title in 2007. Despite this, the game has been slow to catch on in most countries. The object of American football is to score more points than the opposing team within the time limit of the game. The numbers on the field indicate the number of yards to the nearest end zone. American football is played on a field 120 yards long by 160 feet wide. The longer boundary lines are sidelines, while the shorter boundary lines are end lines. Near each end of the field are two goal lines located 100 yards apart. A scoring area called an end zone extends 10 yards beyond each goal line to each end line. Yard lines cross the field every five yards, and are numbered from each goal line to the 50-yard line, or midfield. Two rows of lines, known as hash marks, are interspersed between the yard lines, one yard apart from each other. All plays start with the ball on or between the hash marks. At the back of each end zone are two goal posts (also called uprights) 18.5 feet apart and connected by a crossbar 10 feet from the ground. Each team has 11 players on the field at a time. However, teams may substitute for any or all of their players, if time allows, during the break between plays during time-outs. As a result, players have very specialized roles, and the large majority of the 46 active players on an NFL team will play in any given game. Thus, teams are divided into three separate units: the offense, the defense, and the special teams, which are involved in kicking plays. A standard professional or college football game consists of four 15-minute quarters—typically lasting 12 minutes in high-school football—with a half-time intermission after the second quarter. The clock stops after certain plays; therefore, a game lasts considerably longer than the official game time, often more than three hours in real time. If an NFL game is tied after four quarters, the teams play an additional period lasting up to 15 minutes. In an NFL overtime game, the first team that scores wins; this is referred to as sudden death. In a regular-season NFL game, if neither team scores in overtime, the game is a tie. In an NFL playoff game, additional overtime periods are played, as needed, to determine a winner. College overtime rules are more complicated. The team that takes possession of the ball (the offense) has four attempts, called downs, to advance the ball ten yards toward their opponent's (the defense's) end zone. When the offense gains ten yards, it gets a first down, which means the team has another set of four downs to gain yet another ten yards or score with. If the offense fails to gain a first down (ten yards) after four downs, the other team gets possession of the ball. Before each down, each team chooses a play, or coordinated set of actions, that the players should follow on a down. Sometimes, downs themselves are referred to as "plays." The plays are usually communicated in a "huddle" in which the players group together so that the play will not be known by the opposing team; however, plays are often called out by the captain on the line of scrimmage. These plays are called "audibles" and often involve codes to prevent the opposing team's understanding. Except at the beginning of halves and after scores, the ball is always put into play by a snap. 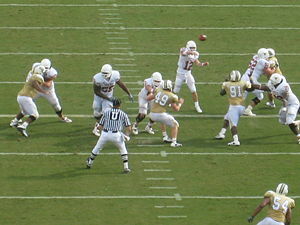 Offensive players line up facing the defensive players at the line of scrimmage—the position on the field where the play begins. One offensive player, the center, then passes (or "snaps") the ball between his legs to a teammate, usually the quarterback. By running with the ball, also known as rushing. One ball-carrier can hand the ball to another player or pass the ball through the air backwards to another player. These are known as a handoff and a lateral respectively. By throwing the ball forward to a teammate, known as a forward pass or as passing the football. The offense can throw the ball forward only once on a play, and only before crossing the line of scrimmage. 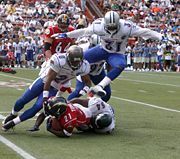 The player with the ball is forced to the ground (tackled) or has his forward progress halted by members of the other team. A forward pass touches the ground before it is caught or is caught out of bounds. This is known as an incomplete pass. The ball is returned to the most recent line of scrimmage for the next down. The ball or the player with the ball goes beyond the dimensions of the field (out of bounds). The team fails to get a first down (i.e., in four downs they fail to move ten yards ahead of where they got their last first down). The defensive team takes over the ball at the spot where the fourth down play ends. A kicker punts the ball while his opponent attempts to block the punt. The offense punts the ball to the defense. A punt is a kick in which a player drops the ball and kicks it before it hits the ground. Punts are nearly always made on a fourth down, when the offensive team does not want to risk giving up the ball to the other team at its current spot on the field and feels it is too far from the other team's goal posts to attempt a field goal. An offensive player loses the ball (a fumble) before being tackled and a defensive player picks it up. As with interceptions, a player "recovering" a fumble can run with the ball until tackled or forced out of bounds. Lateral passes that are not caught, or caught by a defensive player, are considered fumbles. Lost fumbles and interceptions are together known as turnovers. In college rules, a player who recovers the ball by falling on it, may not advance the ball even if he has not been tackled. The offensive team misses a field goal attempt. In this case the defensive team gets the ball at the spot where the previous play began or—in the NFL—at the spot of the kick. If the unsuccessful kick was attempted from within 20 yards of the end zone, the other team gets the ball at its own 20-yard line (that is, 20 yards from the end zone). The defense forces a "safety." If an offensive ball-carrier is tackled or forced out of bounds in his own end-zone—or loses the ball out of bounds there, or the offense commits certain penalties in the end-zone—the defense scores a "safety," worth two points. The offense must then kick the ball to the defense from its own 20 yard line. A player attempts a field goal. A touchdown is worth six points. It is scored when a player runs the ball into or catches a pass in his opponent's end zone. A conversion. After a touchdown, the ball is placed at the other team's three-yard line (the two-yard line in the NFL). The team can attempt to kick it over the crossbar and through the goal posts in the manner of a field goal for one point (an extra point or point after touchdown (PAT)), or it may run or pass the ball into the end zone in the manner of a touchdown for two points (a two-point conversion). A field goal (FG) is worth three points. It is scored by kicking the ball over the crossbar and through the goal posts. Field goals may be placekicked (kicked when the ball is held vertically against the ground by a teammate) or drop-kicked (extremely uncommon in the modern game). A field goal is usually attempted on fourth down instead of a punt when the ball is close to the opponent's goal line, or when there is little or no time left to otherwise score. A safety, worth two points, is scored by the defense when a ball-carrier is tackled in his own end zone, etc., as explained above. Each half begins with a kickoff. Teams also kick off after scoring touchdowns and field goals. The ball is kicked using a kicking tee from the team's own 30-yard line in the NFL and college football (as of the 2007 season). The other team's kick returner tries to catch the ball and advance it as far as possible. Where he is stopped is the point where the offense will begin its drive, or series of offensive plays. If the kick returner catches the ball in his own end zone, he can either run with the ball, or elect for a touchback by kneeling in the end zone, in which case the receiving team then starts its offensive drive from its own 20-yard line. A touchback also occurs when the kick goes out-of-bounds in the end zone. A kickoff that goes out-of-bounds anywhere other than the end zone before being touched by the receiving team results in a penalty. Unlike with punts, once a kickoff goes 10 yards, it can be recovered by the kicking team. A team, especially one who is losing, can try to take advantage of this by attempting an Onside kick. Punts and turnovers in the end zone can also end in a touchback. After safeties, the team that gave up the two points puts the ball into play with a punt or placekick from its own 20-yard line. Rule violations are punished with penalties against the offending team. Most penalties result in moving the football towards the offending team's end zone. If the penalty would move the ball more than half the distance to the defense's end zone, the penalty becomes half the distance to the goal instead of its normal value. Most penalties result in replaying the down. Some defensive penalties give the offense an automatic first down. Conversely, some offensive penalties result in the automatic loss of a down. If a penalty gives the offensive team enough yardage to gain a first down, they get a first down, as usual. If a penalty occurs during a play, an official throws a yellow flag near the spot of the foul. When the play ends, the team that did not commit the penalty has the option of accepting the penalty, or declining the penalty and accepting the result of the play. False start: An offensive player illegally moves after lining up for the snap. The play is dead immediately. Offside: A defensive player is on the wrong side of the ball at the start of a play. If play has started, the penalty is delayed pending the outcome of the play. Holding: Illegally grasping or pulling an opponent other than the ball-carrier. Pass interference: Illegally contacting an opponent to prevent him from catching a forward pass. Delay of game: Failing to begin a new play after a certain time from the end of the last one. Illegal block in the back: An offensive player pushing a defensive player in the back. Face mask: Grasping or touching the face mask of another player while attempting to block or tackle him. Clipping: A blocker hitting an opposing defender from below the waist from behind. Variations on these basic rules exist, particularly in touch and flag football, which are designed as non-contact or limited-contact alternatives to the relative violence of regular American football. In touch and flag football, normal tackling is not permitted. Offensive players are "tackled" when a defender tags them or removes a flag from their body, respectively. Both of these varieties are played mainly in informal settings such as intramural or youth games. Professional, intercollegiate, and varsity-level high school football invariably use the standard tackling rules. Another variation is with the number of players on the field. In sparsely populated areas, it is not uncommon to find high school football teams playing nine-man football, eight-man football or six-man football. Players often play on offense as well as defense. The Arena Football League is a league that plays eight-man football, and also plays indoors and on a much smaller playing surface. 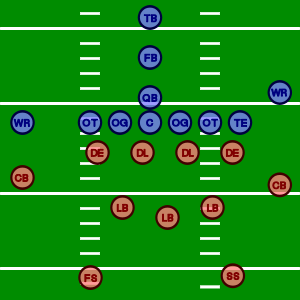 This diagram shows typical offensive and defensive formations. The offense (blue) consists of the quarterback (QB), fullback (FB), tailback (TB), wide receivers (WR) and offensive linemen (C, OG, OT). The defense (red) consists of the defensive line (DL, DE), linebackers (LBs), cornerbacks (CB), strong safety (SS) and free safety (FS). Because teams can change any or all of the players between plays, the number of players at certain positions may differ on a given play. Most football players have highly specialized roles. At the college and NFL levels, most play only offense or only defense, but many will double as special teams players. The offensive line (OL) consists of five players whose job is to protect the passer and clear the way for runners by blocking members of the defense. Except for the center, offensive linemen generally do not handle the ball. The quarterback (QB) receives the snap from the center on most plays. He then hands or tosses it to a running back, throws it to a receiver or runs with it himself. The quarterback is the leader of the offense and calls the plays that are signaled to him from the sidelines. Running backs (RB) line up behind or beside the QB and specialize in running with the ball. They also block, catch passes and, on rare occasions, pass the ball to others. If a team has two running backs in the game, usually one will be a halfback (HB) or tailback (TB), who is more likely to run with the ball, and the other will usually be a fullback (FB), who is more likely to block. Wide receivers (WR) line up near the sidelines. They specialize in catching passes, though they also block for running plays or downfield after another receiver makes a catch. Tight ends (TE) line up outside the offensive line. They can either play like wide receivers (catch passes) or like offensive linemen (protect the QB or create spaces for runners). The defensive line consists of three to six players who line up immediately across from the offensive line. They try to tackle the running back if he has the ball before he can gain yardage or the quarterback before he can throw or pass the ball. In most situations, at least three players act as defensive backs, which are either cornerbacks or safeties. They cover the receivers and try to stop pass completions, as well as tackling runners who enter their areas. They also occasionally rush the quarterback. The other players on the defense are known as linebackers. They line up between the defensive line and defensive backs and may either rush the quarterback, tackle runners, or cover potential receivers. The units of players who handle kicking plays are known as "special teams." Two important special-teams players are the "punter," who handles punts, and the "placekicker" or "kicker," who kicks off and attempts field goals and extra points. Another key special teams player is the kick returner, who tries to run the ball back to place his offensive team in an advantageous position, or even score a touchtown himself. A quarterback is "rushed" by a linebacker. NCAA rules specify only that offensive linemen must have numbers in the 50-79 range, but the association "strongly recommends" that quarterbacks and running backs have numbers below 50 and wide receivers numbers above 79. This helps officials as it means that numbers 50 to 79 are ineligible receivers, or players that normally may not touch the ball. To compensate for the dangers inherent in the game, players must wear special protective equipment, such as a padded plastic helmet, shoulder pads, hip pads and knee pads. These protective pads were introduced decades ago and have improved ever since to help minimize lasting injury to players. An unintended consequence of all the safety equipment has resulted in increasing levels of violence in the game. This has caused the various leagues, especially the NFL, to implement a complicated series of penalties for various types of contact. Despite protective equipment and rule changes to emphasize safety, injuries remain common in football. It is increasingly rare, for example, for NFL quarterbacks or running backs to make it through an entire season without missing some time to injury. Additionally, 28 football players, mostly high-schoolers, died from injuries directly related to football from 2000-2005—although many of were related to dehydration or other examples of "non-physical" dangers. Concussions are common, with about 41,000 estimated every year among high school players. Extra and optional equipment such as neck rolls, spider pads, rib protectors, and elbow pads help against injury as well, though they do not tend to be used by the majority of players because of their lack of requirement. The danger of football and the equipment required make regulation style football impractical for casual play. Flag football and touch football are less violent variants of the game popular among recreational players. National Football League Official website. - www.nfl.com. National Football League Official Signals. – www.nfl.com. This page was last modified on 23 January 2018, at 21:29.